After five years of delays and construction, the iconic, historic Plunge Pool at Belmont Park is scheduled to re-open on June 1st. 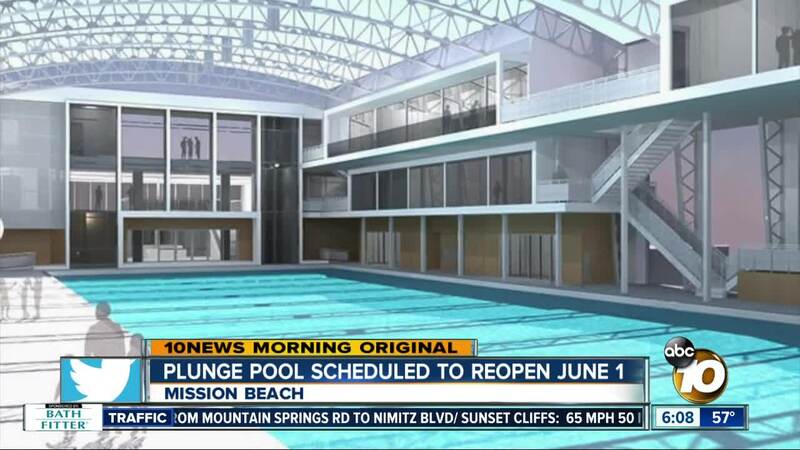 MISSION BEACH, Calif. (KGTV) - After five years of delays and construction, the Plunge Pool in Mission Beach is scheduled to re-open on June 1. "There was a lot of I's to dot and T's to cross with this thing, so we've taken our time," explains Belmont Park General Manager Steve Thomas. "We've invested the capital to make sure that things are where we want them to be. It feels good to be involved in a project like that." In addition to rebuilding the pool, the new Plunge will include a state of the art fitness center, run by Fit Athletic Club. The pool, which opened in 1925, closed in 2014 in dire need of repairs. That process didn't begin until January of 2017 because of issues with the Coastal Commission and other government entities. Throughout construction, people in Mission Beach have been wondering when it will reopen while reminiscing of their time spent in the old Plunge. "Our kids, we used to bring them here when they were little," says Sharon Delgadillo. She and her husband Henry walk by the Plunge while they exercise in Mission Beach and have stopped frequently to check on its progress. "It will be awesome that another generation can enjoy this pool too." "It's a piece of our history," says Mission Beach Town Council President Matthew Gardner. He says the management from Belmont Park and the Fit Athletic Club has done an excellent job at providing updates to the council at their monthly meetings. He was thrilled to hear they have an opening date set for June 1st. "You better believe I'll be first in line to get a membership for the pool," says Gardner. The Fit is already selling memberships to the Club, which will include pool access. A manager says they're offering a $99/month special through the end of March. Meanwhile, Belmont Park management says the pool will have its own membership that people can buy if they don't want the full athletic club experience. Those will be sold as monthly or daily passes. Belmont Park is still working out the price points for that. Business owners around Mission Beach and Belmont Park also feel the pool will be a catalyst for more economic growth in the area. Gardner owns a beach rental store next to the pool and says he's already seen an increase of customers who ask about the pool. "I built my rental shop where it is because of how much effort they put into the pool," he says. Belmont Park officials say the unique mix of a large pool near the beach will bring in locals and tourists. "It's going to be right up there next to Balboa Park and the San Diego Zoo," says Thomas of how popular he thinks the Plunge will be when it re-opens. "It's a destination that San Diegans will be proud to have in their neighborhood."